For do-it-yourself investors, it certainly feels like slim pickings when looking for tools to help do fundamental research on junior precious metal mining and exploration sector stocks. Of the research tools and websites that do exist, many are based on technical indicators, ‘black box’ systems or only offer coverage on larger, better-known companies. More often than not, newsletter writers and dense technical research reports are really the only sources of in-depth analysis and ‘filtering’ that investors can access when it comes to junior precious metals companies. Whether it’s because many of these types of companies aren’t big enough or popular enough with a wide investor base, tracking down quality research tools often involves substantial ‘Googling’, forum hunting, sifting and filtering. At times mining the investing data feels like almost as much work as mining for an actual mineral or metal itself. One company, however, is betting that they can help redraw the analysis landscape for investors with their new platform: Tickerscores. At the Vancouver Resource Investment Conference this past May, Visual Capitalist, a company known for producing mining and exploration sector infographics, rolled out the beta version of their newest venture and potentially game changing stock analysis platform Tickerscores. 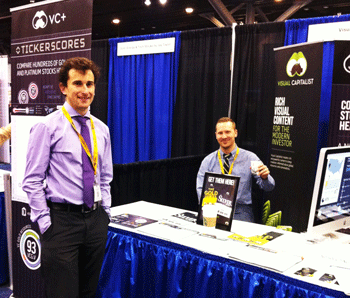 Members of the Visual Capitalist Team, Rob Fuhrman (left) and Nick Routley(right) at the Tickerscores beta-launch at the World Resource Investment Conference May 2013. Tickerscores is a web-based tool that provides in-depth analysis of mining and exploration companies by looking at the common components used to assess the overall health and promise of a company and/or its projects. For the moment, the universe of stocks covered will be in the junior precious metals mining and exploration space, with market caps typically underneath $1 billion. The goal for the platform, however, is to include all precious metal mining and exploration companies listed on the TSX and TSX Venture exchanges. Slated to launch in September 2013, Tickerscores aims to help investors interested in mining and exploration stocks crunch important data quickly and deliver it in a visually appealing, intuitive format. While pricing has yet to be officially determined, the projected subscription range is forecast to be between $25 to $60 per month. A video walk-through of the Tickerscores site is available at the end of the post (or you can click here to access it directly).